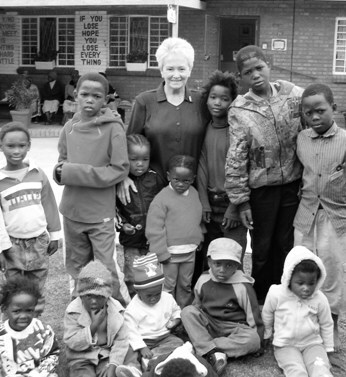 Sister Ethel Normoyle with children at the Missionvale Care Center. Today I went to the annual Rotary Foundation Seminar here in San Diego. In addition to the 400 or so people in attendance at the Salk Institute, there were also tables and tables of food to fill the grumbly tummies of Rotarians. The mostly older crowd filled up on cantaloupe, honeydew, and watermelon while I did my best to find my group. The catering trays piled high with bacon, and the lines for fresh coffee near the entrance to the auditorium made getting in an arduous process. I thought to myself about how often I am offered free food. Staff meetings, conventions, conferences, and parties all offer low cost calorie collecting opportunities. It made me consider how people in the upper echelons of our culture make more money, have more opportunities, and yet usually have free things offered to them all the time. It makes one wonder how often politicians and celebrities are given things just because of who they are, when there are plenty of people who have a much greater need. Food is an expected perk, not anything to really think twice about. Yet the seminar today was about the great work Rotarians are doing all around the world. I learned about Peace & Justice Fellowships, Scholarly exchanges, and projects taken on by Rotary members that bring food, water, education and health care to people who need it most. I was in attendance because I will be heading out on a Group Study Exchange with Rotary in January to Kenya and Uganda. The keynote speaker of the event was Sister Ethyl Normoyle of South Africa. Normoyle founded the Missionvale Care Centre in South Africa to, “provide love and care for the poor and destitute, with particular emphasis on those living with HIV/AIDS.” Each day they distribute 250 food parcels, 650 bread and soup meals for families, care for 500 orphaned children, provide schooling for 173 students, and help adults find work as well as access government grants. They do this not as a handout program, but as a way to be part of the community, to bring people together. The township where Missionvale Care Centre resides was created by the government during the apartheid. Those who live there were thrown out of their homes by the government and left without options. What struck me most about Normoyle was not the work she has been doing for the last two decades at Missionvale, but the audacity of her vision for the future. She stood in front of a group of concerned citizens who are more than 5,000 miles away from South Africa and explained that in order for her group to sustain their work they need $5 million dollars. Almost in the same breath she reminded audience members that right now these people have no choice in life, and they need our help. She added that each Saturday they bury at least 25 people who die from HIV/Aids. So while Kerri and I had a disagreement today over one of the rules of this project, other people were being buried after a life without choices.